– Jim Snowden, inaugural San Jose Jazz Board Member and decades-long Summer Fest volunteer. When most people think of San Jose Jazz, they think of Summer Fest; where for nearly a quarter of a century, the second weekend in August has thrown the streets of downtown San Jose into a full-on mix of sounds from around the world–with stages blaring anything from straight-ahead and Latin jazz to swing, blues and more. For some residents of Silicon Valley, volunteering for Summer Fest is a long-standing, even familial, tradition, while for others, volunteering for three hot days of sizzling summer jazz is something new. Either way–whether veterans or newbies–our volunteers are the lifeblood of the festival; We couldn’t do it without them! With a mission to build a stronger and more vibrant community through music education and live performance, San Jose Jazz needs volunteers not only during our two annual festivals, but throughout the year as well. Can you help us? Internships are available for Summer Fest positions. This is an intense and rewarding experience that will allow you to gain real-world experience in marketing, community engagement and education, in the world of music production. Requirements and duties vary, and are tailored to satisfy the interests and goals of our interns. For detailed descriptions and how to apply to each position, click on the available internships below. Year-round internship opportunities are not always posted online. For inquiries regarding year-round internships contact info@sanjosejazz.org to learn about available positions. 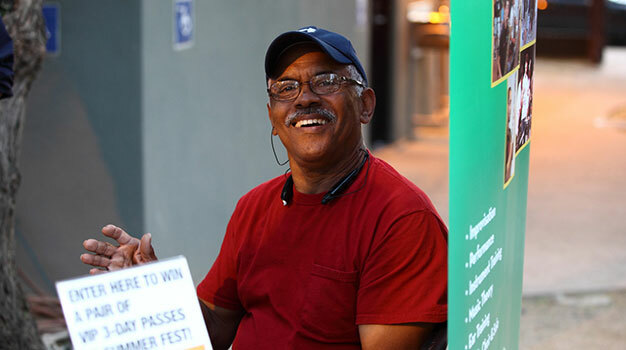 During Winter Fest and Summer Fest, San Jose Jazz needs help with everything from checking wristbands at the door, to ushering, to operating the elevator at the Theater on San Pedro Square; no matter your interest, we can usually find something interesting for you to do! Recruitment for Winter Fest volunteers begins in January, while recruitment for Summer Fest begins mid-spring. To be alerted to upcoming festival recruitment, job descriptions and activities please email volunteer@sanjosejazz.org, and ask to be added to the “Volunteer” and/or “Festival” email lists, in order to ensure hearing from us once volunteer recruitment begins. If you have any further questions, or would like to be a part of our team, please contact the San Jose Jazz Volunteer Coordinator at volunteer@sanjosejazz.org or via phone at (408) 288-7557 ext. 2310. Looking for a paid position with San Jose Jazz? visit our Employment page.